Levelised cost of electricity (LCOE) can be computed from only four factors for solar power. For thermal dispatchable plants, the LCOE can be computed from seven factors. Further, there are three alternative ways to compute LCOE. Levelised cost of electricity or Levelised cost of energy (LCOE) is described below using three methods. The first method is using level carrying charges; the second is using the formula LCOE = NPV(Revenues)/NPV(Generation); and, the third is computing [FV(Capital Cost) + PV(O&M Cost)]/NPV(Generation). The three alternative LCOE calculations are discussed below beginning with the four/seven factor approach that applies a level carrying charge rate. This is a bit long and maybe you will say TLNR. Sometimes I think it is better to explain things in full. A key idea of the page is that LCOE is not a good way to make comparison of intermittent renewable facilities with dispatchable plants. I have tried to put together various ideas in the slides below. In the case of solar power, the capital cost per kW, the operation and maintenance cost per kW-year and the capacity factor are discussed in the solar resource analysis page. The tricky thing and often the most important factor is the carrying charge rate. The carrying charge rate is discussed in detail in subsequent pages. In the exercise file you should see how the carrying charge is the EBITDA divided by the investment cost. For the first case, use the scenario with no inflation. In this case a flat carrying charge is what the word levelised comes from: Flat = Level. The second file below is a completed exercise. The two files below include an exercise where you can work through these equations using a very simple PMT function. You can work through this example in the file to be downloaded below. The first file has blanks that you can fill-in. The second file has completed data that you can use to verify the results. To make a LCOE analysis, all you have to do is set-up a little table where you input the four factors. The excerpts below demonstrate how the drivers of LCOE for solar and demonstrate how to compute LCOE on a nominal basis and a real inflation adjusted basis. The first excerpt demonstrates the three factors other than the carrying charge rate. The trickiest factor to explain is the carrying charge that converts an one-time cost into an annual cost and recovers return of capital, return on capital (depreciation), taxes, decommissioning costs and other items. The carrying charge should be computed so that the real on nominal rates are the same over the life of the plant. Hence the name level. An illustration of how to compute carrying charge using the PMT function is shown below. The real rate is computed as (1+nominal cost of capital)/(1+inflation) -1. Project finance is really all about computing the carrying charge rate. Once all of the factors are defined and the carrying charge is established, you can compute the levelised cost of electricity. You convert the fixed cost per kW-year to the cost per MWH. Finally, the LCOE can be computed per the formulas above. 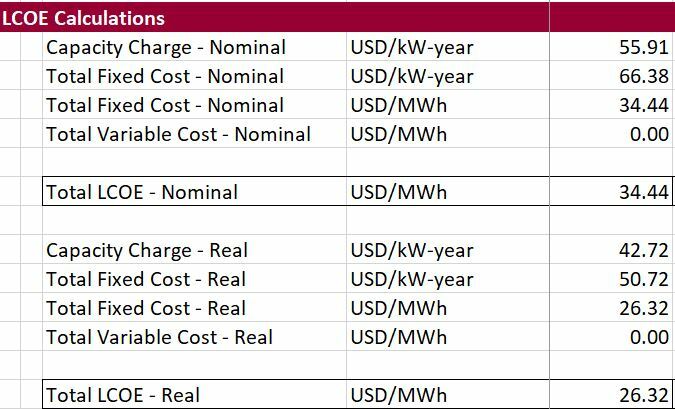 For the solar project, the LCOE comes all from fixed costs as illustrated below. I have made many files that evaluate the LCOE for different technologies and included sensitivity analysis. You can download a couple of these files by pressing on the buttons below. The screenshot illustrates one of the scenario analyses. A few files that demonstrate how to compute the LCOE. This file has a sensitivity analysis for the LCOE as illustrated in the screenshot below. Excel File with LCOE for Solar and Multiple Scenarios with Degradation, Cost of Capital, Capacity Factor etc. The second method for computing LCOE which should give you the same answer as the first method is computing the NPV of revenues at the overall cost of capital and then dividing that number by the NPV of Generation. This is like taking the NPV of the price. Many people ask why in the heck would you use the NPV of a physical quantity like MWH in the denominator. The answer is simply weighting. If the price is not the same in each period, this approach as the effect of weighting each price by both the present value factor and the relative amount of generation in a period. In sum, this method which is often used to evaluate different bids by off-takers involves the following formula. The spreadsheet file below and the associated video prove how this method really is the weighted average price and why it produces a reasonable number. This method can be illustrated by creating a very simple model with energy generation, revenues the inflate, operating cost and capital expenditures. Once revenues and generation are computed, the NPV of revenues and generation can be computed. The screen shot below illuatrates the process from LCOE method 2 for three methods. There are three bids with different price patterns. To compute LCOE you should account for generation and the PV factor. You could compute the weighted average of the NPV of generation or you could use the formula. The equivalence of these methods is demonstrated in the screen shot below. With revenues and generation, the LCOE can be computed with the NPV formula below. The first NPV formula reconciles to the LCOE formula above. The second formula shows that the LCOE process can be used to compute the level O&M per kW-year when the denominator is the capacity rather than energy. The final calculation is made with the real discount rather than the nominal discount rate. In this case, the LCOE reconciles to the real LCOE. As with the first basic LCOE exercise, you can find the exercise to reconcile the financial model with the carrying charge LCOE Method 3: – (Captial Cost + NPV of O&M) Divided by NPV of Generation. The screen shot below shows that the cost method reconciles with the NPV of revenue method. I have made a few other analyses and videos about LCOE. The video that is attached below addresses how the LCOE for solar can be compared to the variable operating cost of thermal plants so that you do not have to worry about the non-dispatchibility of the solar. The video also addresses how to compare base load plants with different availability, where you should evaluate the cost of the unavailability of the plant relative to the marginal cost of running other plants during the outage and how this can be incorporated into LCOE. The second video below addresses how to compute the real LCOE in today’s Euro, CFA, GBP, USD etc., rather than the LCOE that is on a nominal basis unadjusted for inflation. The real LCOE provides a much better measure of current costs and a better comparison of fuel intensive technologies with capital intensive technologies. The real LCOE can be computed as NPV(Nominal Rate, Nominal Revenues)/NPV(real rate, MWH Generation). The proof of the real LCOE is shown in the video below. A third LCOE video describes an LCOE database that I have created which tabulates electricity costs and performance statistics from well known sources including the IEA, Lazard and the EIA. The video explains how to use the carrying charge spreadsheet along with a database that collects the costs. The LCOE database is available for download in the file below. 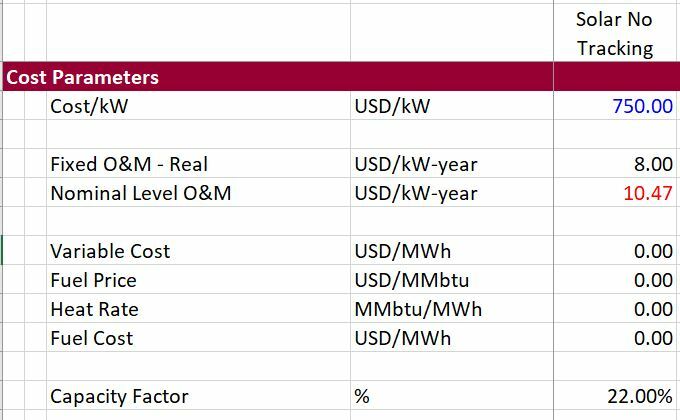 In this file you can compare capital costs, O&M costs, heat rates, renewable capacity factors and other statistics and also evaluate the LCOE. The video also gives you a little introduction to Power BI. Convert the Cost per kW from an one-time cost to an annual cost. This produces the cost per kW-year. The carrying charge can be thought of as the amount of annual EBITDA required for to support an amount of up-front cost and provide debt investors their return, equity investors their return and pay taxes. You can think of it as like the loan payment on a house divided by the price of the house. Add the fixed O&M costs expressed in Amount (e.g. Euro/kW-year) to the annual carrying charges stated in Euro-kW0year to derive the total annual cost per kW-year. Compute the total fixed cost per unit of energy used rather than capacity. To do this, you need the capacity factor or the yield. The hours that must be covered by the fixed cost are 8766 x capacity factor (8766 instead of 8760 because of leap years). The total annual fixed cost per MWH as the annual cost x 1000 divided by 8766 x capacity factor. Now you are finished — that’s it. there are no variable costs or fuel costs, so the fixed cost spread over the lifetime of the project on a level basis is the total cost per year divided by the energy provided. For economic purposes and when evaluating battery technologies, the cost per MWH should be compared only to the cost/MWH of selling energy. For example, the cost of a diesel plant. This is because the capacity of the diesel plant will be needed for times in which the solar plant cannot produce electricity like at night time. For the cost of the solar plant and the diesel to be comparable, the costs must be expressed in real terms or today’s Euro, Ringitts, USD etc. Otherwise you are comparing newborn babies with middle age people. In simple terms, the carrying charge can be computed using the PMT function in excel, where you use the real and not the nominal discount rate. 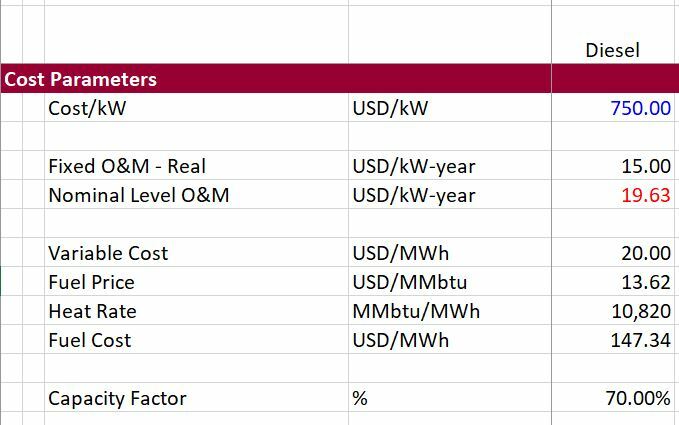 These drivers are the central issue to any LCOE analysis and include (1) capital cost/kW (over night); (2) Fixed O&M cost per kW-year; (3) Variable O&M cost per MWH; (4) Capacity or availability factor; (5) Heat rate for dispatchable plants (MMBTU/MWH); (6) Fuel cost per MMBTU for dispatchable plants; and (7) Carrying Charge rate that converts capital costs into EBITDA that increases over time. The carrying charge rate is the most difficult to work through mechanically. The other factors can be derived from various sources ranging from Lazard LCOE reports to the cost analysis for Chinese coal plants in Pakistan to the using financial models and pvinsights for solar projects. For the base load plant, you can measure the effect of different availability by the avoided cost of unavailable time. You can start with the idea that you want as much energy as possible. This means you should compute the energy at 100% capacity factor minus the energy that is acutally used. The difference between the energy for 100% and at the availability factor can be measured at the avoided cost of electricity. Lazard investment bank has published studies on LCOE that have gained a lot of attention. On television I saw the former govenor of the U.S. state of Michigan refer to the study after somebody well know had made silly statements in a tweet that a cold day disproves the presence of global warming. The Lazard studies had a whole buch of football field diagrams that may look fancy but don’t really tell you much. If you want to use the Lazard study you need to know the specific capacity factor and put in a carrying charge rate. Then you can do something much better and compute the LCOE yourself. Also, the LCOE should be in real terms not in nomial terms as in the Lazard study. I have not finished uploading all of the LCOE files that have examples of LCOE techniques. You can get these files by sending me an e-mail at edwardbodmer@gmail.com. I will eventually upload these files with LCOE comparisons.